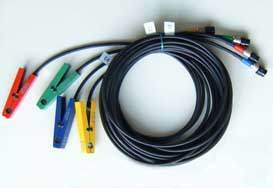 - Injection timing or LAMBDA Sensor signal. 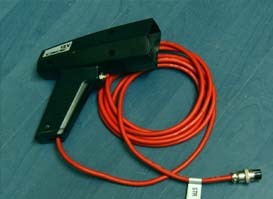 Piercing probes with cables - 2 pcs. Polypropylene case for storing and transport - 1 pc. Ability for almost simultaneously and differentially watching of the parameters for every element and its technical accuracy or its unallowable deviations. 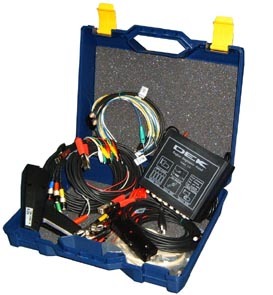 This allows the diagnostic procedures of the ignition system to be reduced to minimal levels. - Sensors for pressure, flow, detonation, oxygen, etc. To see the full cycle of the ignition system and to create a static image on the screen, the deviation of the electronic beam in horizontal direction must correspond to one full cycle, which in four-cycle engines corresponds to two revolutions of the crankshaft. 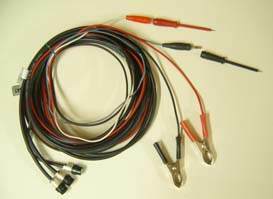 For the horizontal synchronisation of the beam with the frequency of rotation of the crankshaft an inductive sensor, which is connected to the ignition cable of the first cylinder is used. Thus on the screen of the oscilloscope a picture of the variation of the primary or the secondary voltage for one full cycle of the engine. The signals are placed one after other, one above other or one over other in the order of work for each cylinder. This allows the difference of work for each cylinder to be checked. The checks by an oscilloscope represent comparisons of the achieved images, i.e. the dimensions and the forms of the curves of the voltage variation, with standard curves, which correspond to properly working state of the ignition system and its components. The comparison operations are done by the diagnosticitian, who only watches the image of the real state. For logical comparison that is needed for making a decision, a good detail knowledge of the picture of the properly working system must be possessed. With the development of electronics and automotive building all producers of automobiles have got the ability to develop engines with lower harmful gas emissions, with a higher PWM and thence lower fuel consumption. Lots of companies that produce electronic components have been involved in the development of specific details for the production of ignition systems and the control of the fuel-air mixtures. This has led to a wide variety of the carburettor systems (mechanical or electronic), of the injection systems (mechanical or electrical; mono-spot or multi-spot), of the ignition systems (contact, non-contact, distributing, static, multi-sparkling, etc.) and anything else that can improve the comfort and the security when driving. All the new electronic devices that are serially mounted by the manufacturers are digital devices that are thought to calculate with high speed time impulses. 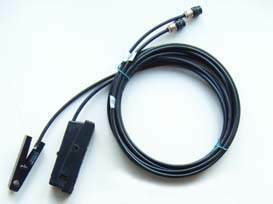 This is referred to injection computers, ignition systems and ABS brake computers as well as for simplest car devices as wind-screen wipers, relays for flashers and even central-locker blocks end electric windows. After the invention of the first benzine engine lots of time has passed and nowadays it is clear enough when the spark must be passed in the cylinder filled with the fuel-air mixture and how long the spark must be. It has been found that for diagnostics of different ignition systems an oscilloscope is needed that is necessary to be fast for measurements and slowly to turn off its image. Of course this is necessary in the idle running test of the engine but 70% of the tests are made in that case. Respectively the oscilloscope must have the ability to self synchronise not only by the revolutions but also by the impulses coming from each cylinder. The electronic-beam pipe oscilloscopes have extremely high-detail graphics but they are not clear enough for short processes that are repeated in long periods (e.g. 850 rpm of the engine). For example, if we would like to observe the ignition cycle of an engine with an integrated computer control (fast coil – Rprim.=0.9 Ohm, charge time 4ms and spark time 2ms) with a speed of 850 rpm and if we are interested in the voltage of the spark then the whole range on the horizontal will be 160 ms, i.e. one spark will be near 1% of the width of the whole visible space. This fact forces a lot of specialists to speed up the engines and to shorten the time for one ignition cycle, thus they increase the dimension of the duration of the spark on the screen and they increase the repetitiveness of the graphic (frames per second). 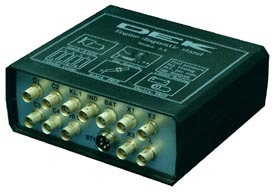 The computer oscilloscopes have some advantages because it can be tared in milliseconds for the new models of ignition systems as well as in degrees for the older ones. Its principal of work is a little different of those of the conventional oscilloscope and this has its advantages and disadvantages. Depending on the software the computer oscilloscope can save very long series of events in its memory and then to show the independently of the input signals. However this approach is rarely used for engine diagnostics. Usually the software saves one full cycle of the engine and after that it shows the graphic on the computer monitor in a way that has been chosen from the diagnostician. After saving the voltage values of the ignition system the oscilloscope synchronises them to respond correctly to the corresponding cylinders. The visualisation then is done with a little delay because of the fact that the drawing of the screen is done immediately after the completing of the engine cycle of work. The graphic stays on the screen while in the memory of the computer the next full cycle of the engine is loaded. This visualisation is much better than the constantly blinking electronic-beam oscilloscope which refresh rate is exactly equal to rpm/120 or in other words – for 750 rpm the refresh rate is 6 Hz. The ability of the software to save graphics for future comparison or just for education is also one of the advantages. Actually the computer oscilloscope, no mater what kind is it, is the next step forward in the science and technologies. Computers have entered in all fields of human knowledge and manufacturing.